A Rayco brand stump grinder — which the police said is “believed to be the only one of its kind in Bermuda” — was stolen, and a reward is being offered for its return. A police spokesperson said, “On Wednesday 30th December 2015 police attended a Theft report at Island Construction, 79 Middle Road, Devonshire. 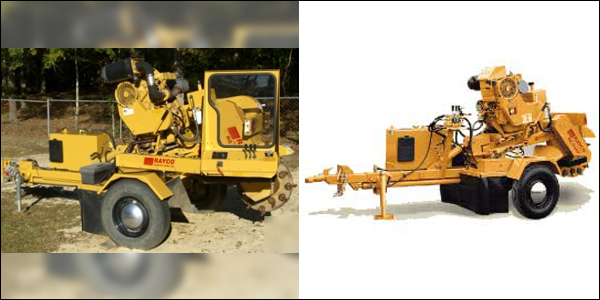 It was reported that between November 2015 and December 30th 2015 someone had removed an industrial stump grinder which was stored on the Island Construction property. “The Rayco brand stump grinder is described as approximately five years old, yellow in colour with red fenders and a Duete diesel engine. It is believed to be the only one of its kind in Bermuda. In addition, a reward will be offered for its return, and people are asked to call 536-4495 if seen. Update 12.47pm: To clarify, the reward is being offered by a separate entity, not by the police. is there anything people won’t steal? I wish I knew who did it but I’m stumped! Inside job. Somebody does not want the AG Report Commission getting to the root of the problem. If YOU stole this machine YOU have to be Bermudas dumbest criminal…but i bet a staff member borrowed it….lmao. Someone planning on getting rid of a body? Who in their right mind is stupid enough to steal such a unique piece of equipment.. Remember when the Tucker Cross was stolen ? A grinder you say … Look for someone who has a huge field of Marjuana . You gotta wonder what the heck they thought they were going to do with it. It’s in a container heading south as we speak. I bet you are correct. There were a bunch of thefts years ago where a group of men were caught stealing tons of random products, loading them in a container and then shipping them south. It was as I read my previous post , I was reminded of a discovery a few years ago were a group of people got together and loaded a container full of stolen building materials , toilets , air conditioners etc. to be shipped undetected to a particular island to the south ….. I wonder if they’ve regrouped and maybe this huge piece of equipment has already swam across … Happy hunting ! « Column: What Has Been Achieved In 3 Years?